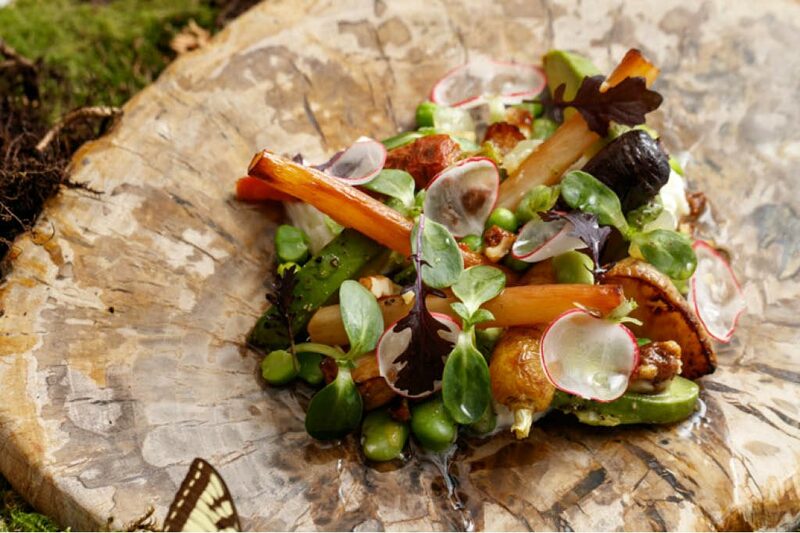 Botanist, Vancouver’s highly anticipated new restaurant inside Fairmont Pacific Rim, has opened its doors last month. The restaurant presents a collection of four diverse spaces -a dining room, cocktail bar and lab, garden, and a champagne lounge. Designed by Ste. Marie Design in collaboration with Glasfurd & Walker, the collection of venues begins with the Champagne Lounge. Overlooking The Lobby Lounge on the second floor, it’s surrounded by glass and planters filled with greenery indigenous to British Columbia. The Champagne Lounge is open daily from 4:00pm and offers global sparkling wines and exclusive and rare offerings from both Champagne and internationally, complemented by a menu of small plates including oysters, caviar, seasonal crudités, and local artisanal cheese platters. In contrast the Cocktail Bar, with a dark palette of Italian Terrazzo and dramatic curved glass, is dedicated to the creative science of cocktails. Led by Grant Sceney, the hotel’s creative beverage director, and David Wolowidnyk, Botanist head bartender, the international award-winning duo created a list of whimsical yet sophisticated cocktails. The elevated beverage experience is enhanced by the Cocktail Lab with commercial kitchen elements such as a centrifuge, band saw, and roto-vaporizer. Select libations give a nod to its chemistry inspired roots and botanical background. The Deep Cove for example uses Island Gin, sea buckthorn, and blue algae and is served in a bespoke glass molded onto a log of driftwood. Located at 1038 Canada Place, the dining room and garden will be open seven days per week for breakfast, lunch and dinner service, and the bar opens daily from 11:00am. Reservations can be made by visiting the website at botanistrestaurant.com or calling 604-695-5500.